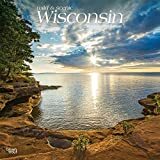 Wisconsin's enchanting and diverse geography consists of rolling farmlands, sparkling lakes, rivers, sprawling forests and two Great Lakes shorelines. 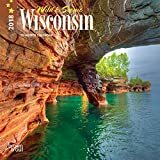 Get to know "The Badger State" better in this unique calendar that not only features twelve dazzling landscape photographs but also includes suggested destinations, annual events and helpful websites to add even more enjoyment to your future road trips. The large format wall calendar also includes six bonus months of July through December 2018; large daily grids with ample room for jotting notes, appointments and reminders; moon phases: U.S. and international holidays. 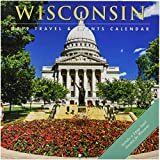 The Wisconsin Travel & Events Wall Calendar highlights stunning photography from â€œThe Badger Stateâ€? all year round. You'll see the beauty of the state's rural and urban landscapes along with a monthly events column listing local art fairs, sporting events, community activities and more. The calendar also features a "Number Please" directory which provides contact information to over 100 local organizations and places of interest. Daily grids offer ample room for jotting notes, appointments and reminders, along with providing moon phases and national & international holidays. 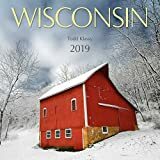 This is a terrific planning guide, memento or gift for all residents of Wisconsin and for anyone who yearns to travel there. Wisconsin boasts two Great Lakes, the Mississippi River, vast forests, and rolling farm country. Autumn is particularly stunning, as copper hues infuse the trees with magnificent colors, and thousands of Canadian geese commence their annual migration. 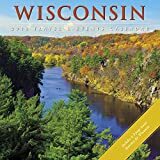 Take a tour of wild and scenic Wisconsin with this beautiful mini square wall calendar. Prove you are a passionate Wisconsin Badgers fan with this 12" X 12" academic wall calendar! 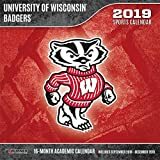 This calendar features 16 months (Sept. 2018 - Dec. 2019) of full-color action shots of the top players from Wisconsin athletics, along with player profiles, stadium & mascot images, and visually appealing graphics designed with the school's colors and team logo!